Who will he betray? His father? His king? All the intricacies of the real life Gunpowder Plot weave their way through Fawkes, creating a brilliant tapestry threaded with danger, ambition, and magic. The magic system is a cornerstone of the story, while Thomas Fawkes’ relationship with his father is another. The story opens as Thomas, a boy of 16, is abandoned yet again by his father, whom he has not seen in 13 years. His father is absent at Thomas’s coming-of-age ceremony, in which he was to have presented his son with a mask he created especially for his son’s emergence into adulthood. It is a life-altering lapse that causes Thomas to be expelled from his school, unable to claim his use of magic or finish his education and pursue a profession. Worse than that, it leaves Thomas stranded with no recourse for healing the plague that has turned his left eye to stone. Thomas journeys to London to confront his father and finds himself embroiled in the Gunpowder Plot. It is a journey that takes him from his start as a young, self-centered, frightened, and somewhat cowardly boy to a conflicted conspirator questioning the beliefs and attitudes foisted upon him by others. He is a boy starting to believe there is more to magic and murder than he’s been told, a boy who begins to question the loyalty that he has to men who may have very little loyalty to him or the truth. Fawkes investigates the motives and truths behind the Gunpowder Plot, how it affected our world and what drove it. It is plot fraught with men willing to murder entire groups to bring about a change in their government, while some of the men they intend to murder had been too willing to murder those that they themselves disagreed with. As one character says, “Did murder ever free anyone?” The more you look below the surface of Fawkes, the deeper it gets, touching on racism, bravery, truth, loyalty, love, faith, and fanaticism. It’s an enlightening coming-of-age journey that’s well worth the read. Don’t forget to read an important addition to the story, the Author’s Note: What’s True and What’s Not. 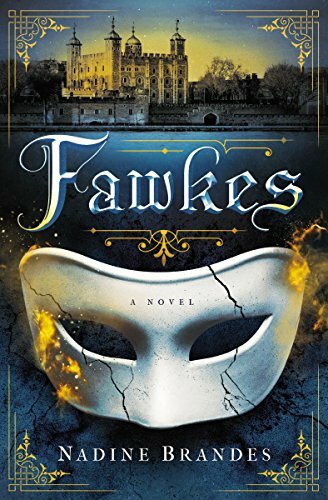 And if you’re really into the story like me, read up on the Gunpowder Plot; the more you read, the more you realize how much meticulous historical detail Nadine Brandes wove into Fawkes. Highly recommended for those who love fantasy, history, allegories, or simply wonderful storytelling. If you love Brandon Sanderson, Connie Willis, Lois McMaster Bujold, Diana Wynne Jones, or any of the other greats who weave engaging multi-layered stories around wisdom and truths about the human condition, you’ll love Fawkes.